Brought to you by Aqua Leisure (makers of Uncle Bob's Snow Tubes), the Pipeline Sno Turbo Snowtube creates a fast, cushioned ride. The tube is made of heavy-duty, cold-resistant PVC, with two heavy-duty PVC handle grips helping you hold on tight. The seat panels in the center of the rider area, meanwhile, are built to keep your bottom dry. It also sports new cool graphics for this year. I received a Giant 54” Pipeline Snow tube last week from Aqua-Leisure to review and giveaway! Which was actually perfect timing since the kids didn't have school for 4 days due to snow & the holiday. We got about 20 inches of snow last week and then another 5 or so on top of that! 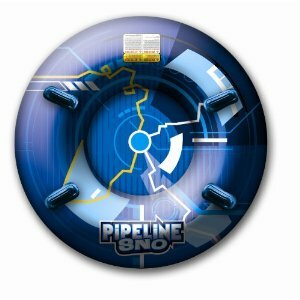 We have used the Pipeline Snow tube twice so far. After I blew it up, my daughter and I went sledding. Let me just say this tube is awesome! My daughter went flying in this thing. I notice she went further then anyone else did on the tubes they had. I even got on it with her and went down the hill! We also went Sunday down my sister's, and my sister was also really impressed with how far she went on this tube. My daughter is having so much fun with it. And looks like we may be getting some more snow Friday! Win it: One lucky reader will win their own Giant 54” Pipeline Snow tube from Aqua-Leisure. RULES: Giveaway is open to US residents only. Giveaway ends February 4, 2011 11:59 PM EST. Winner will be chosen via Random.org. Must have valid email in blog profile or leave email in comments otherwise you will be disqualified. Winner will have 48 hrs. to confirm by email, If no confirmation in that time frame a new winner will be chosen. Disclaimer: I received the product free of charge for the sole purpose of reviewing and offering a giveaway. No other compensation was given, and my opinions are my own. I remember going sledding on Christmas eve after we got home from the midnight service. It was great! Entered the Resurrecting Anthony giveaway. i have a fun memory of taking my kids sledding last week on a big hill near our home. I'd love to try this aqua leisure sled, looks fun! My favorite time sledding is going to Art Hill with my family including Aunts, Uncles, and Cousins. I'd love to win so we could go sledding in our back yard. My three kids need a new sled--and the two person design would be great! I would love to win this would be great for my kids. We really neeeded this during our last snowstorm! We resorted to a trashcan lid. I remember sledding all day when we had a snow day when I was in 5th grade. It was a blast. I remember getting the huge tubes and sledding with a bunch of friends all at once as a teenager. i want to win so that i have my own sled to go sledding with my niece! 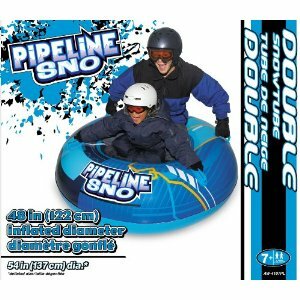 I'd love to win this- my two boys love to sled:) Thanks! I'd love the Boys Floatation Suit for my youngest!! I loved going sledding in the back yard with my sister when I was young. Get in a roll with this kid-powered oversized, super-wheel! I'd love to win this as a gift for my nephews- they'd have a blast! sliding down the park's hill and landing in the ditch of slushy water, walking home to change clothes, went to the park and it happened again. Mom said no once I got home again and I would have to stay in for the rest of the day! We have gotten a lot of snow and LOVE to go sled riding. I once worked at a grocery store and the owner said he would do my job if I took his little boy sledding. We had such a fun day and I got paid for it! As a child we often hooked a sled behind the snowmobile and went sledding! Funniest memories were when there just wasn't enough snow and we were dragging on dirt! I Like Aqua-Leisure on Facebook - emillie rose. I commented on Aqua-Leisure's facebook page saying I want to win - emillie rose. The instant adult shelter looks great! I am your friend on Facebook - emillie rose. I follow you on twitter and shared this giveaway - hisprincess886 - http://twitter.com/#!/HisPrincess886/status/32160088131108864. I"Like" STAY AT HOME MOM on Facebook - emillie rose. I Subscribe by email - using my @gmail.com address. I have 4 sons who would love this! My favorite memory is as a young girl we had a sledding hill we had to walk about a quarter mile to. My mom came along with my little brothers and SHE got on a toboggan with us and flew off on a bump. Not a load of laughs for some, but my mom, a mom of NINE, never had time away from house, and kid or farm duties so this was a great day for me! LIKE Aqua Leisure on FB! I posted on the sponsors FB wall that I am entering their sponsored giveaway here! I put in a Facebook Friend request! Id like this little Rookie soccer set at Aqua Leisure! One of my favorite sledding memory (and I have many!) is of sledding with a large group of teens. We'd had a huge snowstorm and then an ice storm, so we FLEW down the hill on our sleds. We even used pieces of cardboard to sled on, which was fun. The hard part was coming back up the hill, lol...we had to cut holes in the ice for "steps". So fun! My sister and I would practically run to a hill on a relative's property. We'd sled for hours and then just drag ourselves home. I entered the cupcake sleeve giveaway. My favorite time sledding is when I my kids were like 8 and 6 and we were in the mountains. We just found a place on the side of the road and they had the best time!! I would love to win because this its the first winter my son is big enough to sled with my husband and all the stores have been sold out forever! I would love to win this for my boys they would really enjoy it. I would love to win this because I know 5 kids who love to sled and would have a blast on this! I remember being pulled around on the sled behind the four wheeler when we were young. We were not prepared for all of the snow that we have had this year. So this would be great to have for my children. I am a fan of Aqua Leisure via Facebook as Jill Myrick. I am a fan of Aqua Leisure via Facebook as Jill Myrick #2.